The Wanganui Girls Under 15 Hockey team claimed a SILVER Medal at the National Championships Tournament in Carterton 1-6 October 2018. 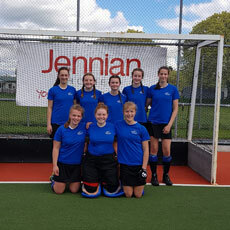 Back row L-R; Georgia Forrester, Rhiannon Clutterbuck, Baylie Hilbourne, Maggie Jones, Carys Pram. Front row L-R; Olivia Smith (Captain), Kyla Manville, Charlotte Baker. The team played some really good hockey and improved with every game. They came away with the SILVER Medal after losing to Canterbury in the final.